Ok, are you ready to get sewing?! 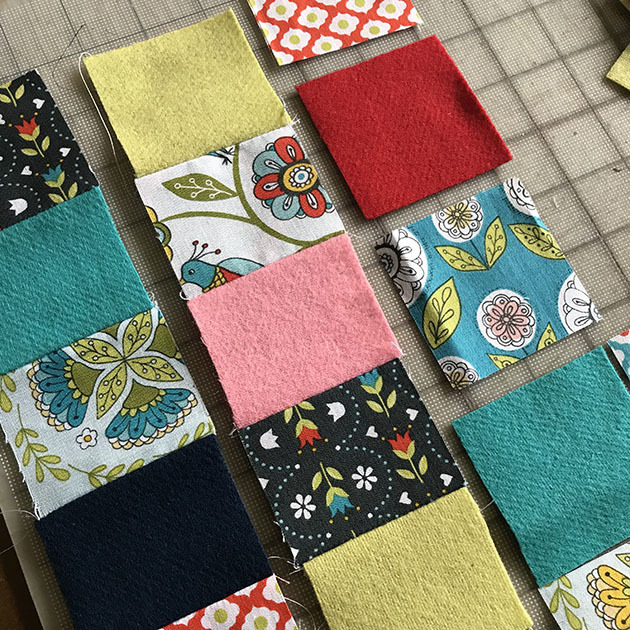 I hope you “llam-alongers” have all of your materials prepped and cut from Day 1 of the Patchwork Llama Sew-along. Now onward to Day 2: Sewing the patchwork. 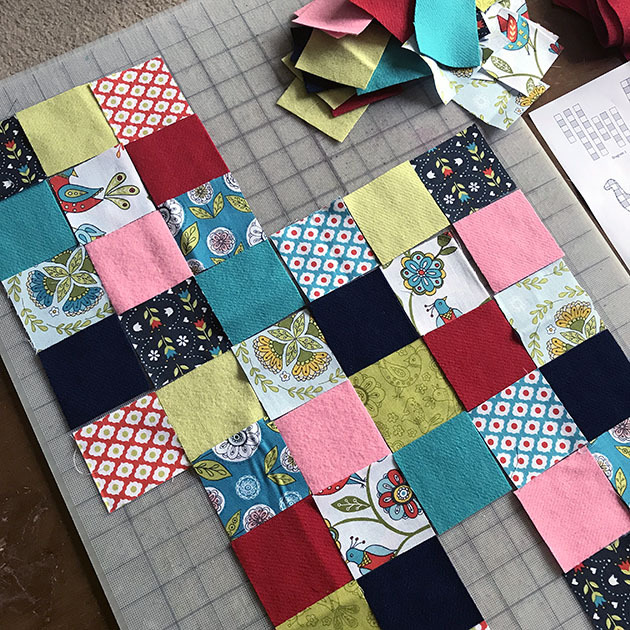 The first thing I did was lay out all of my wool solid and cotton print squares in a checkerboard fashion. I tried to get a good balance of light and dark and not have 2 of the same color touching…more or less. You’ll be doing this twice, once for the front and once for the back, in a mirror image. 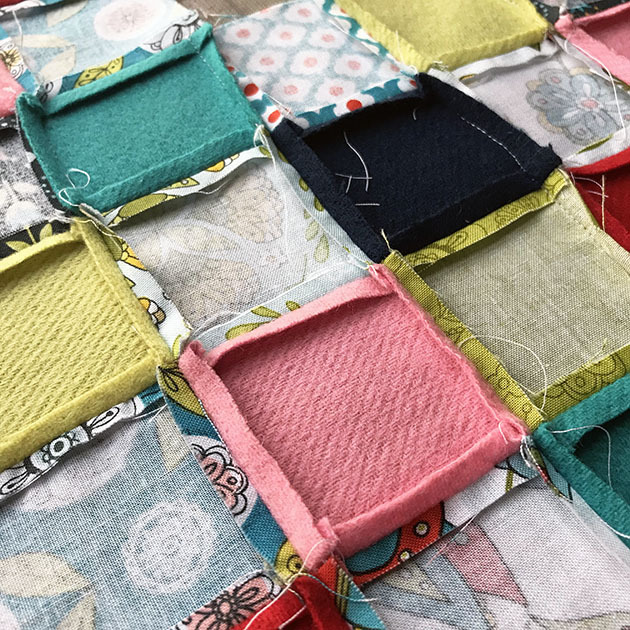 Next you’ll sew the squares together in vertical columns. Before you start, take a quick photo with your phone for reference! It’s really easy to forget what your layout was once you start taking things over to your machine. I flipped each of my print squares over, right sides together, on top of it’s wool neighbor. Then sew the pairs together with a 1/4″ seam allowance. If you’d like, you can “chain stitch” them together, assembly line fashion. 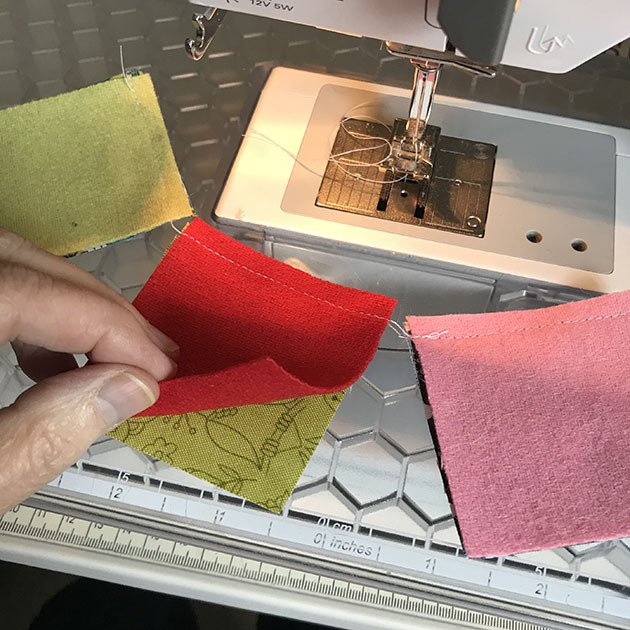 As you are finishing sewing one pair, just feed in the next pair of squares without trimming the threads. Then when you’re done you can snip the connecting threads. Press your seams open then go on to sew the next column. Once you have all of the vertical columns sewn (Diagram 1), place the columns right sides together, matching the seams. 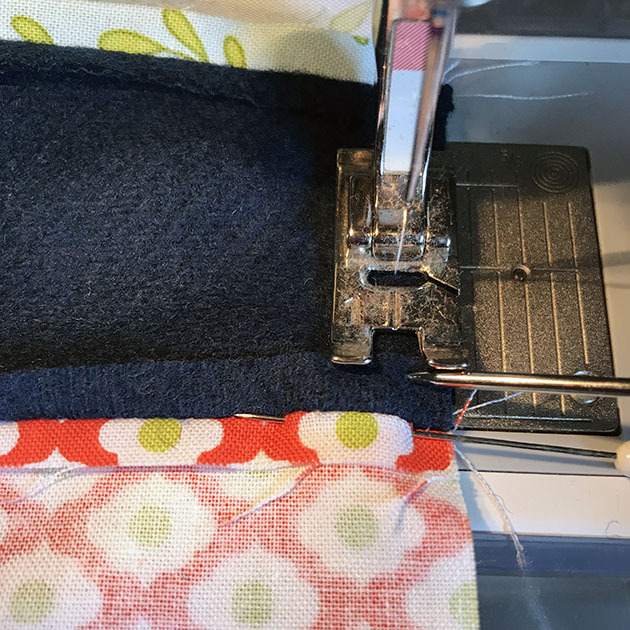 As I lined up the seams, I placed a pin to hold them together right in the seam line. I also used a stiletto tool to keep the seam allowances flat as I sewed over them. Follow Diagram 2 on your pattern to assemble all of the sewn columns to each other. Now press your vertical seams open. Repeat this so you have a full front and back sewn that are a mirror image of each other. 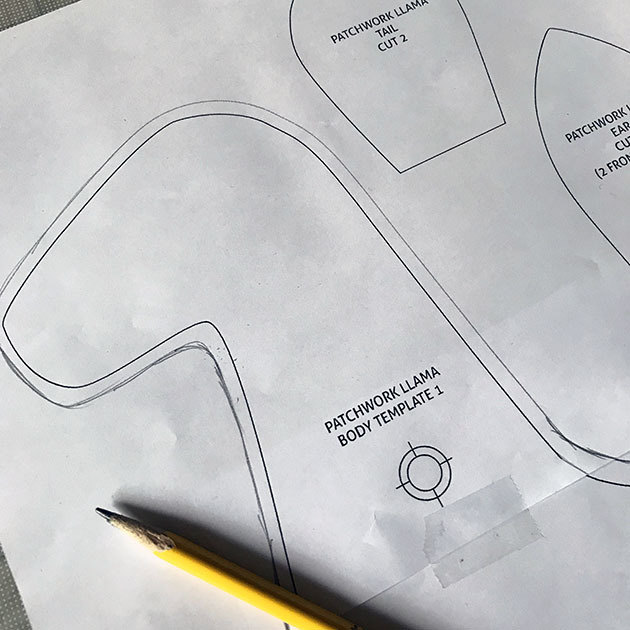 If you haven’t already printed out your Llama Body templates, go ahead and do that now. Line up the bulls eye symbols and tape the sheets together. 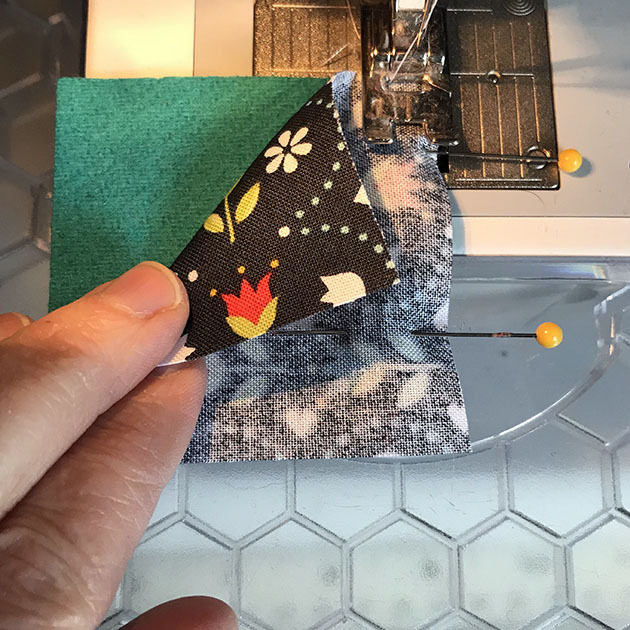 Be sure to add a 1/4″ seam allowance to the template before you cut it out on your pencil line. That’s it for Day 2! 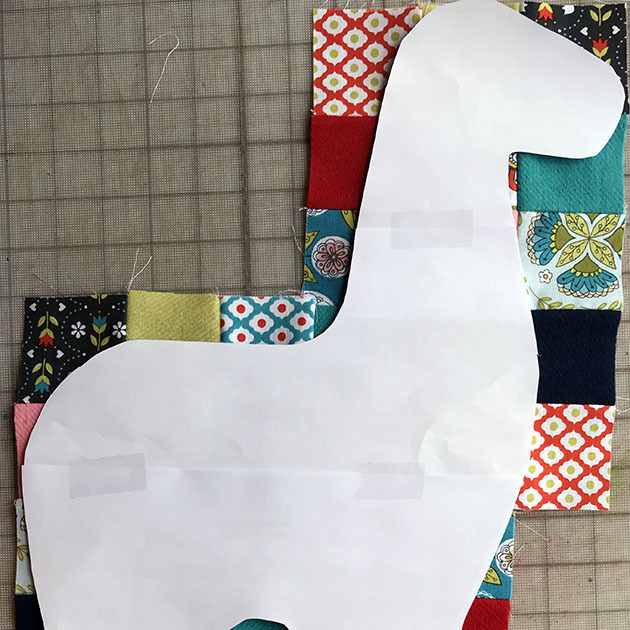 Stay tuned for Day 3 on March 20th when we’ll cut out and assemble the llama! In the meantime please feel free to post your progress in the School of Wool Facebook group or share on Instagram with the tag #betzwhitellamalong. Hope you’re having fun with this! Please let me know if you have any questions.